Ringleader of the Tormentors is the eighth studio album by English alternative rock singer Morrissey. It was released on 3 April 2006 by record label Attack. The album was described as showcasing "a thicker, more rock-driven sound", which Morrissey attributed to new guitarist Jesse Tobias. The album debuted at number 1 in the UK Albums Chart and number 27 in the US, and also reached number 1 in Sweden, Malta and Greece. Recording for the album commenced in late August 2005 in Rome, Italy. Mixing began in late October 2005. Originally Morrissey was to record the album with producer Jeff Saltzman, however, he could not undertake the project. Early in recording Morrissey's publicist described it, contradictingly, as "the most full-on rock record Morrissey's ever done. It's a balls-to-the-wall rock record, not a slow one like the last one". The musicians recording with Morrissey in Rome were Alain Whyte, Boz Boorer, Jesse Tobias, Gary Day, Michael Farrell and Matt Chamberlain. Chamberlain replaced Dean Butterworth, who decided to continue drumming for the band Good Charlotte. Marco Origel, from the San Francisco area, handled engineering on the album. The album's opening track, "I Will See You in Far-off Places", was leaked on the internet on 2 February 2006. The music combines mystic chanting, horns, buzzsaw guitars, a pounding bass line and relentless drumming with vocal gymnastics reminiscent of several tracks from You Are the Quarry such as "Come Back to Camden" and "You Know I Couldn't Last". The album's first single, "You Have Killed Me", was first broadcast on the radio station BBC 6 Music on 4 February 2006. The song's lyrics reference Rome and Romans several times, with lines such as "Piazza Cavour, what's my life for? ", mention of Italian film directors Pier Paolo Pasolini, who was born in Bologna but lived in and wrote about Rome, and Luchino Visconti, and actress Anna Magnani who starred in movies of both directors. "You Have Killed Me" was released on 27 March 2006 and reached number 3 in the UK Singles Chart. The entire Ringleader of the Tormentors album was leaked on the Morrissey fansite Morrissey-solo on 5 March 2006. "In the Future When All's Well" received some airplay in the United States on alternative rock radio. The album has also been in continuous rotation on Left of Center, Sirius Satellite Radio's college and indie rock channel. Ringleader of the Tormentors was released on 3 April 2006. It became Morrissey's third number 1 album on the UK Albums Chart, selling 62,000 copies in its first week of release in the UK. It was also the first British album charting to include download sales, 1,200 of which were full album downloads of Ringleader of the Tormentors. The album peaked in its debut week at number 27 on the Billboard 200 in the U.S., and according to Neilsen Soundscan, has sold 98,000 in the U.S. as of August 2008. Ringleader of the Tormentors received a mostly favourable reception from critics. Andy Gill of The Independent wrote "Musically, it's both tougher and lusher than You Are the Quarry, with proper orchestrations replacing that album's nasty synthetic strings." 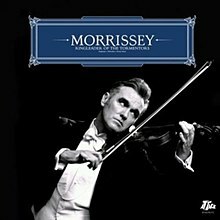 Stephen Thomas Erlewine of AllMusic wrote "it's easy to enjoy Ringleader of the Tormentors as merely an everyday Morrissey record, but it's hard not to shake the suspicion that this album is the closest he's ever been to forgettable." Ennio Morricone – string arrangement on "Dear God Please Help Me"
Children's choir on "The Youngest Was the Most Loved", "The Father Who Must Be Killed" and "At Last I Am Born"
^ "Morrissey Rocks, Revels in Rome on New Album | Billboard". Billboard. 6 January 2006. Retrieved 17 February 2015. ^ "Tony Visconti v3.0". tonyvisconti.com. 11 January 2005. Archived from the original on 4 March 2012. Retrieved 17 February 2015. ^ a b Sexton, Paul (10 April 2006). "Morrissey Earns Third No. 1 U.K. Album | Billboard". Billboard. Retrieved 18 February 2015. ^ Cohen, Jonathan (5 August 2008). "New Morrissey Album Pushed to Early 2009 | Billboard". Billboard. Retrieved 18 February 2015. ^ a b Erlewine, Stephen Thomas. "Ringleader of the Tormentors – Morrissey | Songs, Reviews, Credits, Awards | AllMusic". AllMusic. Retrieved 17 February 2015. ^ "The 46-Year-Old Virgin on Blender.com". Blender. May 2006. Archived from the original on 4 May 2006. Retrieved 17 February 2015. ^ Petridis, Alexis (24 March 2006). "CD: Morrissey, Ringleader of the Tormentors | Music | The Guardian". The Guardian. Retrieved 17 February 2015. ^ a b Gill, Andy (24 March 2006). "Album: Morrissey: <!-- none onestar twostar threestar fourstar fivestar --> – Reviews – Music – The Independent". The Independent. Retrieved 17 February 2015. ^ Needham, Alex (31 March 2006). "NME Reviews – Morrissey: Ringleader of the Tormentors | NME.com". NME. Retrieved 17 February 2015. ^ [ Hogan, Marc (3 April 2006). "Morrissey: Ringleader of the Tormentors | Album Reviews | Pitchfork". Pitchfork. Retrieved 17 February 2015. ^ Walters, Barry (12 April 2006). "Morrissey Ringleader of the Tormentors Album Review | Rolling Stone". Rolling Stone. Retrieved 17 February 2015. ^ "Danish album certifications – Morrissey – Ringleader of the Tormentors". IFPI Denmark. Scroll through the page-list below until year 2013 to obtain certification. ^ "British album certifications – Morrissey – Ringleader of the Tormentors". British Phonographic Industry. Select albums in the Format field. Select Gold in the Certification field. Type Ringleader of the Tormentors in the "Search BPI Awards" field and then press Enter.